There’s a Trivia Night coming up in Vancouver, in support of one of my favourite local causes! 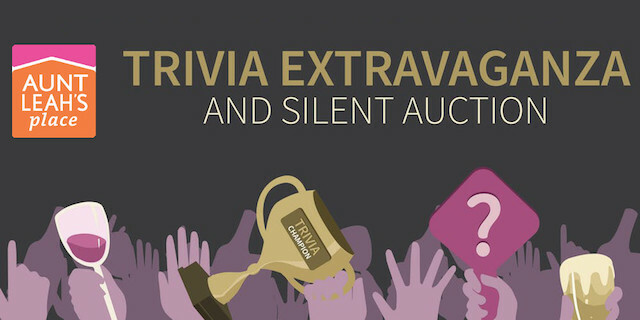 Aunt Leah’s is hosting a Trivia Extravaganza and Silent Auction on April 27th which will be a fun night of obscure facts, laughter and good times, as they raise money for local foster youth in need. The evening includes live music, delicious craft beer generously provided by Luppolo Brewing, and dozens of Silent Auction items to bid on. I love Trivia Nights. One of my crowning achievements came last summer when I was visiting my in-laws in small town Iowa. Every time John and I visit, we go to Trivia Night (first Tuesday of the month) and this time our family team won. It was a tough challenge, but it was a glorious victory. There was even a trophy that took two hands to hold up above my head triumphantly (and rather obnoxiously) as our team posed for photos afterward. So, I’m very excited to offer up the opportunity to YOU to join a Trivia Night here in Vancouver, thanks to Aunt Leah’s. Aunt Leah’s Place helps prevent children in foster care from becoming homeless and mothers in need from losing custody of their children. To support them on their journey to self-sufficiency, they provide supported housing, job training, and coaching on essential life skills. Follow Aunt Leah’s on Facebook and Twitter for more info. I will draw one winner at random from all entries at 12:00pm on Thursday, April 11, 2019. UPDATE The winner is Sarah! A worthy cause, and a great time! This sounds like a fun evening and it is a very worthwhile cause. Thank you for introducing us to a worthy charity. Trivia night would be a fun opportunity to learn more about the work they do. Aunt Leah’s is a great group! This would make a great date night with my Jeopardy-smart hubby! Sounds fun and for a great cause!